You can easily set yourself up for interview success if you commit to doing this one simple exercise in advance. Block out an hour for yourself and get this done; it's one of the smartest things you can do to prepare. This probably comes as no big surprise, but developing some key statements about your past accomplishments will send you into to your next interview with more hope — and better possibilities. Modern job interviews are behavioral interviews — also known as STAR interviews. This is the new norm. This is the format you must prepare for as a jobseeker in today’s economy. 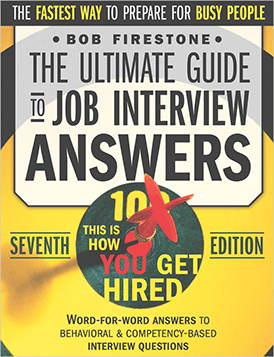 They’re going to ask you to “describe a situation” or ask you to “tell me about a time when …” Their questions are designed to see how you handled challenges in the past in order to measure your suitability and predict your future effectiveness in the role you’re interviewing for. The best way to answer is using prepared STAR statements. Download my free STAR Statement Examples template (use the form at the bottom of this page) and start filling in the blanks. It’s crucial that you have 4 to 8 STAR statement “accomplishment records” fully rehearsed before you step foot in that door. Even if you’re not going on interviews right now, this is a great self-development exercise that all smart people should do from time to time. Think back in time and take an inventory of your accomplishments. Write them out. Make them bite-sized stories. Bring them up when you need to establish credibility or want to make a point. "Sure. To answer your question, about 6 months ago we had a situation where the problem was "XYZ" ... the step-by-step action I took was "ABC" ... and due to my efforts and because of my competencies, the positive outcome was "123." "OK. Let me tell you about a project at [ Company ABC ] where I [ spearheaded / organized / designed / crafted / collaborated on ] an effort that successfully [ reduced costs about 20% / grew revenue by 14% over 6 months / got the job done about 50% faster / saved 37 man-hours of work per week / allowed us to help customers 25% more of the time / reduced XYZ usage by 1/3 ]. The situation we initially faced was ..."
Here is a short-list of action verbs for writing STAR Statements I use for executive clients. You can download my Complete Spreadsheet of Resume and Interview Action Words using the form at the bottom of this page. Download the complete list (over 300 words) using the form at the bottom of this page. Use the verbs as "writing prompts"
— Download the STAR Statement Examples templates & the action verbs spreadsheet. — Start brainstorming job-by-job from your work experience to list projects you worked on, problems you ran into — and the solutions you came up with & the results you achieved. — Create metrics / numbers that demonstrate measurable outcomes / results. Integrate powerful action verbs into your statements. Practice aloud until you can recite your stories naturally — with confidence and a smile! 😎 … and please share this article on LinkedIn if you liked it. Thanks! ~ bob.